This week on DCI.org we'll be hearing from multiyear corps veterans, and why they stay at one corps for years on end. Michael Terry, a baritone player with the Cadets, is about to embark on his seventh year with that 2005 World Champion corps. He auditioned for and made the corps in 1999, as an 8th grader, after his parents served as volunteers. Seven years is a long tenure anywhere -- and by the time Terry, a sophomore music education major at Columbus State University in Columbus, Ga., ages out in 2007, he'll have been a member of the Cadets for the better part of a decade. 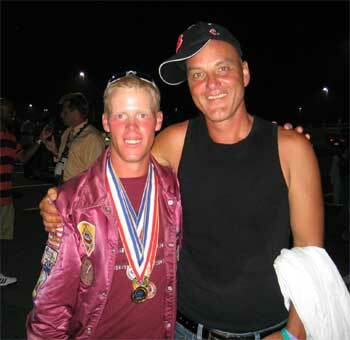 Michael Terry (left) and Cadets program coordinator/DCI Hall of Famer Marc Sylvester. Terry stays with the Cadets for a myriad of reasons, but largely he enjoys the company he's found there. "I love all of the members, my friends and family. I love the staff because of how relentless they are in their pursuit for excellence, yet how much they care for us the members," Terry said. One word sums up another reason Terry has stayed where he has so long: Tradition. "Singing "Holy Name" gives me a rush like nothing else. Our other little traditions here and there mean so much to me," Terry explained. What's the primary thing Terry has learned in his long run with the Cadets? "Probably the biggest lesson I've learned through Cadets is the ability to choose your attitude. The world could be falling apart around you, but you can choose to either let it affect you, or can just go on with your life and be happy," Terry said. Adventures in Time Beyond attitude, Terry analyzed each years he's been with the Cadets and told us what he learned. 2000: Don't go through an entire summer thinking you are an outcast. There are always people to meet, and you will regret not knowing everybody years down the road when someone comes up to you and says "Hey Mikey! Remember me? I marched with you back in the dark ages!" 2001: Winning isn't everything. And second-year-vet-syndrome is something to be avoided at all costs. 2002: You can choose your attitude! Fish! Anybody? 2003: Hard work and dedication pay off at the end of the summer, whether the judges say so or not. 2004: No matter how your corps is doing competitively, you can have some of the greatest moments of your life with your corpsmates off of the marching field. Namely, on a stage in West Chester, Pa., on a dreary, rainy night. 2005: Don't let little petty things disrupt really good friendships, and don't let those things dictate how your summer goes. Competitively, two years stand out for Terry as being the most memorable thus far: 2001 and 2005. "2001 because the entire top three was close all season long, trading victories up until quarterfinals. 2005 was great because we were so far behind everybody in the beginning of the year, but hard work and determination pulled us to the top by the end," Terry said. But in analyzing the 2004 season, Terry remembers it for the people. "The 2004 corps will always hold a special place in my heart. We may not have been the cleanest version of the Cadets there ever was, but we had a bond unlike any other I've experienced with the corps," Terry said. For Terry, two moments have defined his years as a Cadet. "In 2000, after quarterfinals, three other Cadets and I were walking back to our buses after we had taken the corps picture following the performance that night. By the time we were headed back, the audience was exiting the stadium. We were mobbed by fans asking for pictures with us, autographs, or they simply wanted to touch the uniform. I felt like such a celebrity at that moment," Terry said. "The other moment was during the DCI Honor Corps weekend at Disney this past winter. I was hanging out with Paula Hyman (Cadet mellophone, 2002-2006) in her room. One of her roommates was a girl from Pioneer (I'm sorry to say that I don't remember her name!). We were all talking about nothing in particular, when she all of a sudden began talking about how we were completely different from this image of Cadets that she had built up in her head from rumors and such. It made me proud to say that I wear the maroon and gold," Terry said. Juxtapeople Getting back to the people he admires in the corps, Terry wasn't shy about naming names. He admires Cadets director George Hopkins. "While I don't necessarily see eye-to-eye with him on everything, I have to admire the man for what he has accomplished with this organization and for his commitment to the kids," Terry said. Terry also admires the people that work behind the scenes to make the Cadets run smoothly. "The volunteers and admin staff are some of the most dedicated and loving people I know. Noel and Joan Borden, Bill and Pat Croissant, Rick Vale, Larry Laugier, Scotty, Megh Healy, Tiffany Duncan and countless others that I know I'm forgetting. I am forever indebted to them for all they do for the Cadets, and for me personally," Terry said. The quality of the teaching staff also stands out to Terry. "I must say that I have never been let down in any way by the teaching staff here at Cadets. I've been through three extremely different brass staffs, but there has always been a commonality of tradition and dedication. The marching staff has always been great at making us great, and I really love those guys (even when we're on our 12th continuous rep of circle drill at 216 bpm! )," Terry said. Living with the Past Terry is that rare breed of marcher who was basically hatched into the corps he is with today. "I was pretty much born into the activity, so there was really no thought that I wouldn't march somewhere. As far as why I started so early, and with the Cadets: My parents had been volunteers with the corps in 1998 and 1999, so I spent a good deal of time on tour watching rehearsals, shows, getting to know the staff, members, other volunteers, etc.," Terry said. One autumn day sealed his drum corps fate. "In the fall of 1999, I decided that I wanted a chance to play with the horn line just for the heck of it. I knew that anybody could play at the audition camp, so, with my parents' help, I went up to New Jersey and participated in the camp. At the end of the camp, I was asked to come back to the next camp. I didn't really think anything of it other than, "Wow. I get to play with the horn line again. How cool!" Before I knew it, I was learning a drill spot, getting fitted for the uniform, and buying tons of stuff for tour. I didn't even realize what had transpired until the middle of spring training, when it truly hit me that I was a member of the Cadets," Terry said. In looking back, Terry credits his parents for where he's at today. "I want to thank my parents for all of the support they've given me throughout my life, and especially my drum corps years," Terry said. When his college and drum corps career is over, Terry hopes to be a composer or a conductor. He's also interested in doing some teaching. "Instrument repair has also recently garnered my attention," Terry adds.